How many times have you avoided eating ramen just because you didn’t want to end up wearing your food? The problem with having a glorious beard is that something always ends up stuck in your moustache, or even worse, all over your beard. Walking around with snacks for later is never a good way to make friends or even make a good first impression. If you’re out there being a beard ambassador or if you’re interested in becoming part of Team Beardilizer, here are a few pointers to help keep your situation neat. Check your beard after you eat, it’s pretty basic. It’s very easy to find a mirror nearby or even improvise and check in the rear view mirror of your car. While it might make you look vain, what is more important? Getting slapped with a reputation as the guy with two- week old pizza in his beard or the guy whose beard always looks amazing? Exactly. Don’t be gross with crumbs in your beard if you’re spending dollars to get beard oil! After all, if you’re checking your beard on a daily basis to make sure there aren’t strays, how embarrassing is it to find leftover food-things. Another pro-tip: think before you eat. If you’re going to fall face first into a tomato pie, remember to use your napkin since there is nothing worse than walking around with tomato on your face. Some food, despite being delicious, is the natural enemy of your beard. 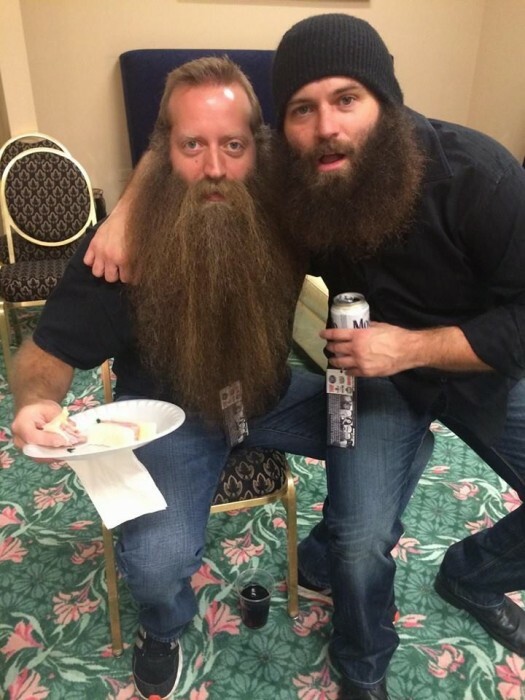 There may be leftovers in your beard and you can’t see them. Cold water on your beard after eating almost anything (anything) can’t hurt. Despite what you may think, your beard will carry odors and sometimes people just don’t want to know that you had for breakfast. Cold water as part of your daily maintenance can keep your beard clean, help you avoid ingrown hairs, and keep your skin free from flaky skin. Don’t go overboard, there is no need to wash your face immediately after you devour a plate of pasta and clams, but if you’re on a date you may want to consider it. Nobody wants to go down in history as “Clam Face”. In total seriousness, remember to tuck your beard to the side. If it is long enough for you to ‘twirl’, turn it to the side and under so you can avoid having messes in the end of your beard. Don’t be afraid of mirrors and when you’re checking your beard use the tips of your thumb and index finger to get rid of stray foodstuffs but also look majestic. If you’re beard game is solid, maybe you should slap a Beardilizer patch on your jacket so that others can join the team. If you have a second, check out the brief video that Action Bronson has some tips on how to get your eating game on point. Hope that you survived Thanksgiving and give your loved ones Beard stuff for the upcoming holidays. The cousin who complimented your beard at the dinner table? Get him a gift box so that he can join you at the Adult Table next year.